“Give me ANY word and I show you how the root of that word is Greek…” Laugh, but it’s (mostly) true. Perfect example for this post? The definition of phobia is, “an extreme or irrational fear of or aversion to something”…and it comes from the Greek word, φόβος, which means fear. Most people fear death, public speaking, heights or spiders. Neither of those bother me. Just red apples and watches. Yep, you heard that right. “An apple a day keeps the doctor away” probably comes from a Greek saying, too, but I digress. Anything that remotely resembles a red, WAXY apple will keep me far away. I love green apples but am convinced I will choke to death on the red ones. The texture, the look and how big they are is just downright creepy. I’m more scared of choking to death on one of them than actually dying. Makes no sense I know- hence, why this is called a phobia! It feels claustrophobic on my wrist like it’s trying to strangle me… and worse? In my mind, it requires way too much time to put on and take off. Something changed in February though. I went to FL for a couple weeks and visited my grandparents at their winter home. 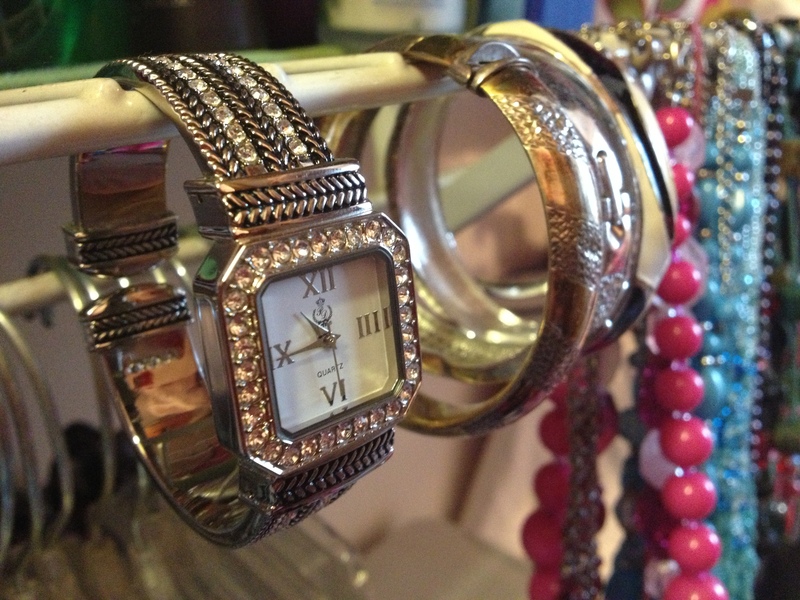 My Yiayia and I went to a jewelry party and I fell in love with this beautiful bracelet watch. I loved how easily it slipped on and slipped off. I loved the sparkle from the diamonds. It looked more like a piece of jewelry than a watch. I was sold. A couple hundred dollars later and I was the proud owner of this special piece. I don’t wear it often- only to weddings and sometimes, church. It adds a sophisticated touch to my jewelry collection (see picture below) in my closet. Not only is it more than a simple, everyday watch, it also is a reminder that it came at a perfect time where I finally stopped feeling so claustrophobic about more important things in life… like commitment or opening up and sharing your future with someone you love. Did that have anything to do with my acceptance of finally wearing a (bracelet) watch? I don’t know…only time will tell.